In memory of a loving friend. This is NO JOKE. We almost lost our first dog this way. It is a common FATAL accident. Cut bottoms off food bags and keep all of them out-of-reach of even a determined unsupervised dog. NOTE: "On the counter" is not "out of reach", especially if you have a cat to knock things down. See comment below 12/14/11 re. corgi fatality from chip bag left on a tabletop. "Like, he really owes me for this..."
Sorry if this is kind of shocking. It's meant to be, so we'll remember. Learn to look at a plastic bag and see a loaded gun. We almost lost our first corgi this way -- there was a hole in the bag, just big enough. Watch your children and guests -- they don't know! FYI, if you're handy, it's not too hard to cut those swinging panels in the cabinet doors. They're attached with strong spring-loaded hinges. The cabinet doors are held by only a magnet, so I added turnbuttons (top photo) to keep out even a determined dog. Babyproof your home. Many things kill both children and pets (Venetian blind cords come to mind). Beware of choking hazards, like bones, too (we DID lose our dog that way). Let's keep this discussion concise. I may edit to keep it quickly readable. Practical safety suggestions are welcome. Spicy Thai? Hmmm...the BBQ chips are the best. I don't know about you, John Wolff. In all seriousness, this is an issue that's very easy to overlook if you don't think of it. I'm sure this discussion will save many a dog. I sure will view such bags differently now that I'm aware of this. Thanks for the reminder. I will keep doors closed and locked. They are pretty smart. Still keeping Dino out of the frig for now. 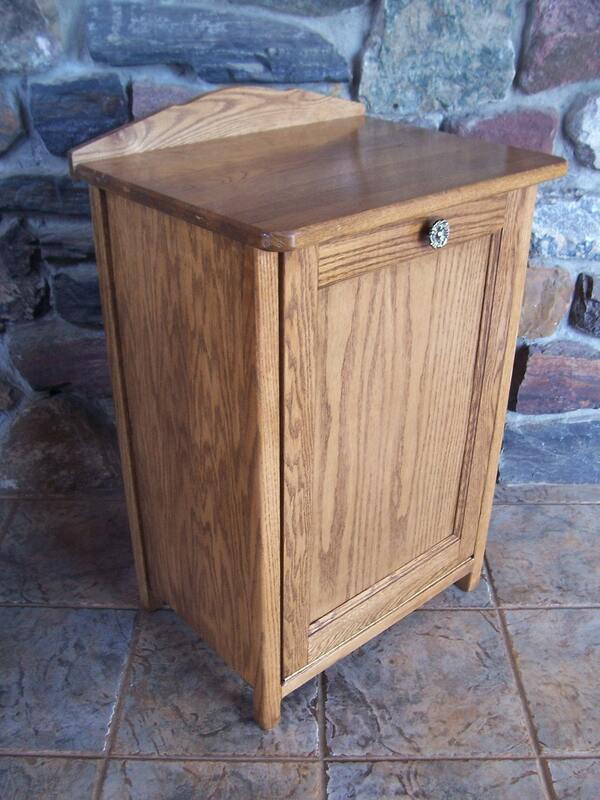 My house doesn't have a closed cabinet type place for a garbage can, so this past summer I bought something similar to this at a craft fair. It was expensive IMO, but it would be very difficult for a dog to knock it over or get into it as it's quite heavy and the door does not open easily. Honestly at the time I wasn't thinking of "dog safety" but I am very happy I have it now. Another good idea and it looks good also. Glad we have such caring corgi lovers. @steve smith - you're right, it's a good idea AND it looks great, unlike my garbage can drawer! We went out yesterday and got child locks for the door where the dogs food bag is kept. I love the garbage can too! Might have to invest in that. I'm also going to start cutting the end off the bags. What happened to Teddy should never happen to another corgi. Don't forget to cut up those plastic soda can rings! Also keep your yarns, strings and even dental floss away from the critters. They can cause intestinal blockages if eaten and strangulation as well. The chief defect of Henry King was eating little bits of string. At length, he swallowed some which tied itself in ugly knots inside. They nodded as they took their fees, "There is no cure for this disease. are all the human frame requires." With this, the wretched child expires. You furkid is sweet to be your model in this public service announcement. It's an important lesson. Someone just posted asking what they need for their new puppy. I wrote back that a trashcan built like Fort Knox seems a must in light of what happened to poor Teddy.